Regardless of how we look at it, examinations influence the course of our lives, thus making it appropriate to wish someone dear to you the best results. That said, here are some inspirational good luck wishes for exams that you can use to wish fortune upon your loved ones as they go in for such tests. You have passed all your tests thus far, so I don’t see why this one should be any different. Good luck! I wish I could give you my courage going into this exam. I don’t think you have anything to worry about but still I wish you good luck. Passing this exam will mark an enormous, positive change in your life. So not only do I wish you well but also good luck! Congratulations for having the courage to take the next step in the advancement of your career, and of course I wish you fence with your exam because more money for you means more money for me! 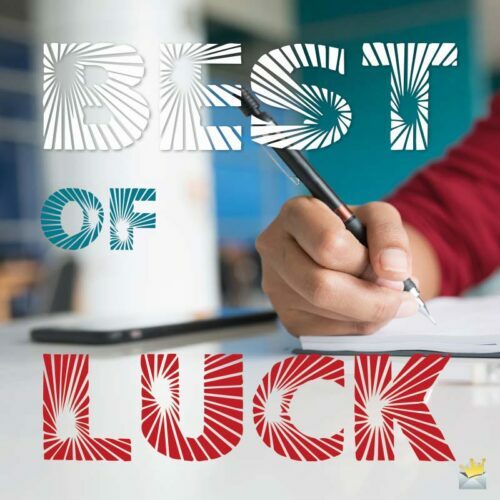 I already know you are going to pass but still want to wish you good luck for the sake of your own edification and self-confidence. This is the moment where you finally transcend levels from a normal employee to an executive. Congratulations and good luck! This is a test of your aptitude in a particular area, not of the overall value of your life. So go in with my blessings and also a spirit of calmness and faith! You’ll see great success. I promise you. May the spirit of Google be your companion throughout this exam. Good luck, bro! You have my luck, hope and good wishes, but that is only going to carry you so far. Now it is up to you to step up and try to knock the ball out of the park! The future of this entire family depends on you passing this test. Lol, just joking. Good luck! This is the moment that you achieve your goal. I am so proud of you, son! Passing this test is the first real step towards becoming an independent man, and it is with the type of tears only a parent can shed that I wish you the best. No matter the outcome of this exam, you can walk away knowing you have given it your best, but we still wish for fortune to be on your side! If you are feeling discouraged today, then may you receive an academic miracle! Good luck, son. I admire you greatly for the way you stayed the course and didn’t back down. You are a winner either way son, but go out there and kick some a**! Today is when all of the hard work, suffering and lack of sleep pay off! I wish you nothing but the best on your exam, son. So proud of you. I know that you have studied hard, and now it is time to show the world what you have learned. Good luck, sweetie! It is your destiny to be the most-successful member of this family. So from the depths of my heart, I wish you the best of luck on your exam. I am more than 100% sure you will ace it like nobody’s business! Whether you pass or fail, we are all proud of your educational advancements. Thank you for making us very, very proud parents. Good Luck! Be on time & ready. Dearest daughter, I sincerely hope and pray that you succeed in your upcoming exams. Good luck. I knew from the moment you were born that you were a genius! Good luck on your exams, dear. You don’t need other people to validate your intelligence, but passing this test sure will make you a lot of money! Good luck, my dear. 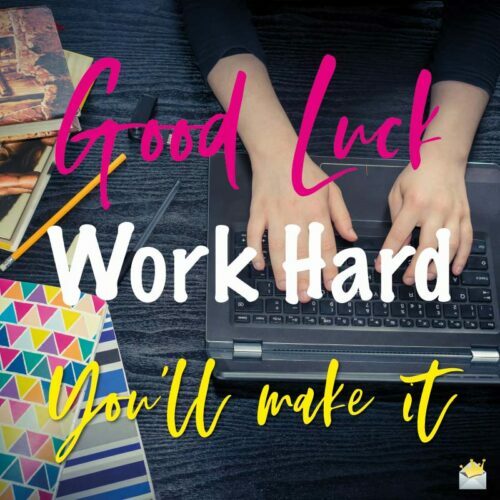 May luck be with you, and where that fails may your hard work and preparation do the rest! You make me so proud. I hope you come out of this test not only successful but also feeling better about yourself. Good luck and thanks for being an inspiration. Wow, I can’t believe my little baby is taking another step towards being an independent woman. Good luck to you on your exams, my angel! Sweetheart, now is the day my investment really pays off. Go out and make me proud! Your preparation leading up to this day was amazing, and there is no reason at all for you not to pass with flying colors. 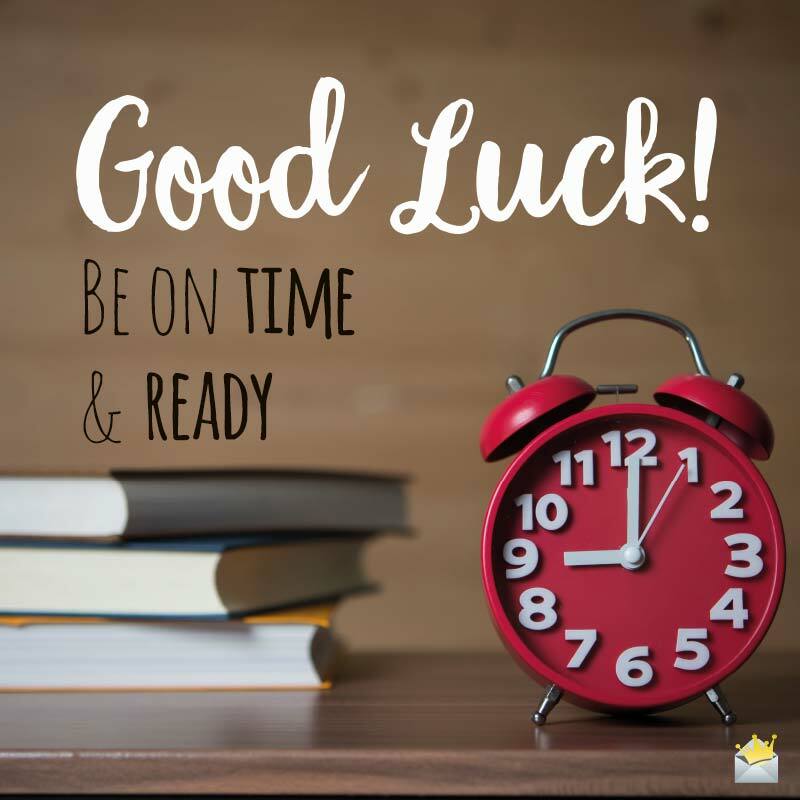 There is absolutely no doubt in my mind that you will pass this test if only you are focused, so take care and good luck! This is your day. You own it! The last three years of your life were leading up to this very moment. Good luck! No single test can define you. You are already a success, and may you come home today with the grade to prove it! I know you will excel. This exam is nothing but a stepping stone to your professional goals. I know you will brilliantly ace it and gracefully make your way to fortune and success! This exam is not only a test of what you have learned but a testament to your resolve and discipline. Good luck, my love. Dear darling, if I could, I would bet every dollar I had on your passing this exam today. Good luck, and always remember my love for you will never die. Today, may you launch an arrow straight through the heart of success! May your exams go better than expected, dear. Deep down in my heart, I have this strong feeling that you’re going to make us all proud. Good luck on your exams, babe. When you cross the finish line I will be the first person there cheering for you. Good luck. I always have been and will forever be proud of you, my amazing boyfriend. Good luck on your exam. Good Luck! Work hard. You’ll make it! Babe, I am utterly confident nothing in this entire universe can ever stop you from acing this test. Good luck. Dear darling, if anyone can pass the exam, it’s you. I therefore encourage you to give it your all. Good luck! In my eyes, you have already passed the exams, but I still want to wish you good luck. Love you. I know what this day means to you and wish you good luck and Godspeed in receiving your positive results! We have been preparing for this day for some years now, and I have full confidence in your ability to pull it off. However, I still want to give you the added inspiration of taking my best wishes with you. You may not enjoy today, but you will come out a better and richer man for it! Good luck, babe. This is a day that you will look back on with a smile for the rest of your life. Good luck, love.